These are sooo romantic, beautiful cups! Love those roses!! Oh my, what gorgeous teacups! I love the colour of the first one and the pinks are stunning too. You always share the most beautiful cups. Can't wait to see your romantic cup for next week. Have a lovely week. a postagem romântica combinou com seus cartões! Wonderful teacuos! I love the Shelley Rose & Red Daisy...one of my favorites! You can never have enough roses! but I think I like the 5th one the best. Thanks for sharing with everyone, once again. Love reading your blog. Hello Terri, I'm still on holidays so I'm hoping you will enjoy my ice cream cup!! LOL I'm off home on Sunday so I'll be back with teacups then!! Those teacups certainly do look romantic. I love the colors and patterns. Every one of them is absolutely beautiful! 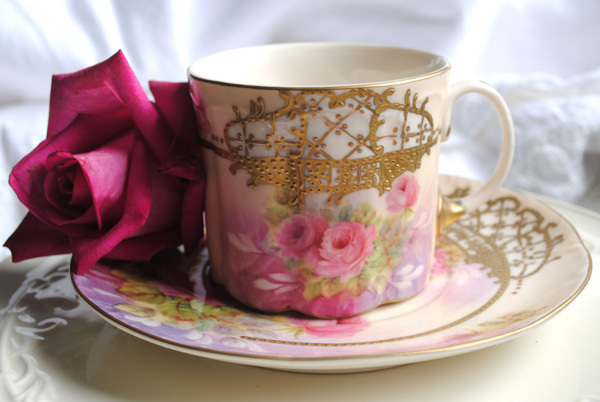 Definitely romantic rose china. A wonderful collection! Beautiful! Hard to decide on a favorite! oh my, you have so lovely tea cups. They are really antique treasures and very romantic. Thank you so much for showing us each week so wonderful inspirations. Wow..I am really drawn today to the tea post..they ALL called out to me..yes very romantic..ever so charming and outstanding and gorgeous! Wow!! Thanks Terri for another beautiful spell! These are almost too beautiful for words! 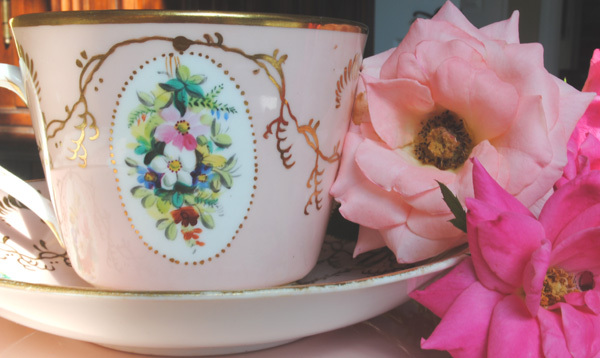 Love your romantic tea cups and the beautiful roses! Happy Tea Day! One of the loveliest things about roses on tea cups is that they never fade! 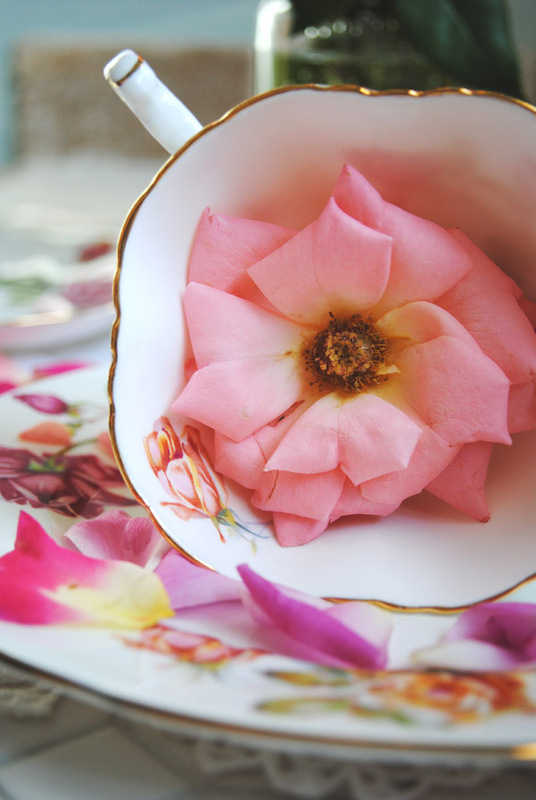 All of your teacups and roses are beautiful! Just gorgeous eye candy! Oh, Terri, your cups ARE so beautiful and romantic! I have always loved tea, especially English and Irish breakfast teas--I always feel such pleasure and comfort whenever I visit your lovely blog!!! Oooo! Terri! How beautiful your collection is this week! I always look forward to your selections and the artful way you arrange them for pictures. I love the rose IN the cup. Always inspiration I take with me when perusing thrift and antique shops! Looking forward to your new site design - and what ARE you giving away! 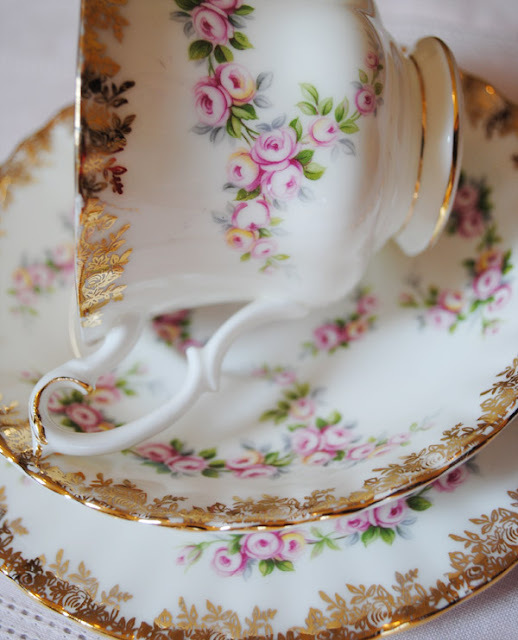 Hi Terri, Gorgeous tea cups! I love the roses. I can almost smell them. 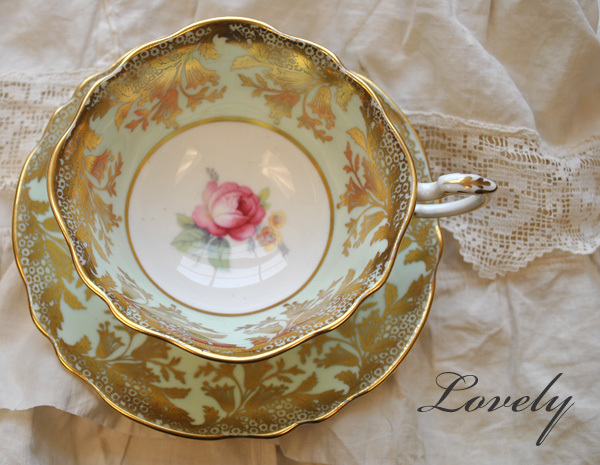 Your teacups are so romantic and gorgeous! I especially love the last one you featured. Thank you for hosting our party each week. What a superb selection of beauties!!! They are all very inspiring for a Valentine tea! And I can't wait to see your new blog! Gorgeous tea cups, Terri....as always! Love especially the second one! I always drool over your beautiful teacups and those teacups make me go ooohh and aaaahhh...soo romantic and beautiful, loving the color and design on them! can't wait to see more romantic cups next week! Thanks for sharing and hosting teacup tuesday! Oh I adore them all but the first with it's Laduree green background has me swooning. thanks for stopping by my blog :). I so love your tea cups, you are inspiring me to collect more. I have odds and ends, and I love putting them all on the able for tea. Terri,I do believe I am drooling, no wait, I'm slobbering! Your teacups are just the most beautiful this week. Just when I think I can't see any more pretty ones, there you go! I also wanted to thank you for the tutorial on the little paper shoes. I am hoping to make some for Valentines. I agree, a fine china, beautifully decorated tea cup does make the tea taste better. All of these are very pretty and yes, romantic. Oh Terri, your tea cups are so beautiful, and yes, very romantic. It is always such a treat to visit your blog. And I LOVE your new blog look. Your new banner is STUNNING! 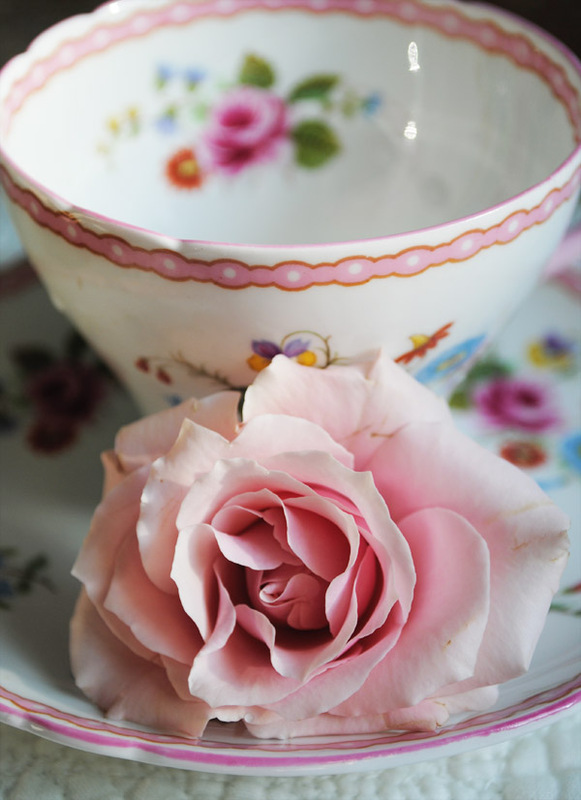 I am amazed at the beauty of the teacups you share! These are truly romantic - thank you for hosting!